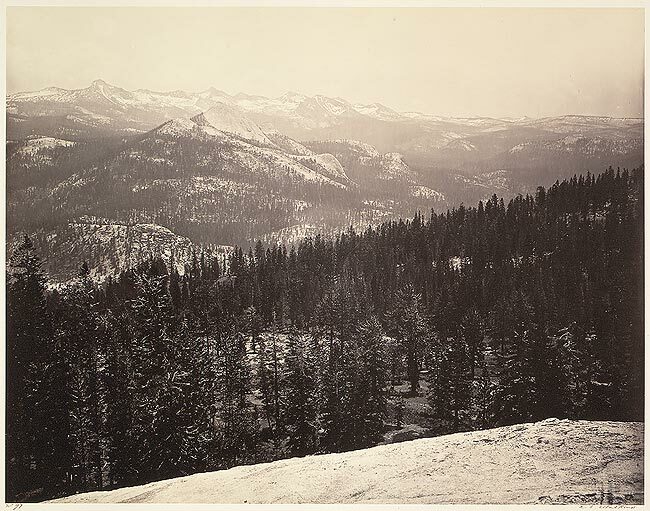 With the rapid expansion into the western frontier of the United States in the mid and late 1800’s, people were becoming exposed to the vast wilderness, the wide expanses and natural beauty of the land through the use of photography. Photographers, such as Carleton Watkins, Timothy O’Sullivan, and William Henry Jackson, made incredible images of the land that helped convince the U.S. Congress to grant Yosemite Valley to California as a state park in 1864, and later, making Yellowstone a national park in 1872. While working as a police reporter for the New York Tribune newspaper, Jacob Riis investigated the slums of the Lower East, documenting the poor living conditions through his writings and photographs which were published in his landmark book, How The Other Half Lives, in 1890. His extensive reportage and photographs served as a catalyst for the reform of building codes and landlord-tenant relations through-out the city of New York. Lewis Hine worked as a staff photographer for the National Child Labor Committee to provide visual evidence of the social conditions facing children at the dawn of the Industrial Age in the early 1900’s in an effort to abolish child labor. After leaving his position as a teacher in 1908, Hine made thousands of photographs, ofter working undercover, of children working across the country in sweatshops, textile mills, factories and mines. He wrote captions for the photographs based on interviews he would conduct with children while photographing them. Presentations of the photographs and statistical facts further illustrated and heightened awareness of the plight of child labor which would eventually lead to Congress passing the Keating-Owens Act that established child labor standards in 1916. Though the act would later be ruled unconstitutional and it would not be until the adoption of the New Deal policies in the 1930’s before child labor standards were established, Hine’s photographs had a significant impact on influencing an empathetic response towards the exploitation of children. Between 1935 and 1943, the FSA photographers (Dorothea Lange, Walker Evans, Arthur Rothstein, Marion Post Wolcott and others) made nearly 80,000 photographs for the Farm Security Administration to document the impact of the Depression on the nation. Many of these photographs focused on rural America and the plight of farmers. The photographs were distributed to newspapers and magazines throughout the country to build support and promote the New Deal policies and programs of President Franklin D. Roosevelt. In more modern and contemporary times, W. Eugene Smith documented the plight of residents suffering from mercury poisoning due to wastewater discharges in the Japanese fishing village of Minamata. Smith, along with his wife Aileen, made many powerful photographs of the effects of industrial polluting and the fight between the village and the Chisso Chemical Corporation for compensation. The photographs were widely published in magazines and eventually as a book, Minamata. In the mid-1980’s, Sebastião Salgado spent nearly two years photographing the drought-stricken Sahel region of Africa in the countries of Chad, Ethiopia, Mali, and Sudan, where approximately one million people died from extreme malnutrition and related causes. Working with Médecins Sans Frontières (Doctors Without Borders), the photographs were published in the book, Sahel – The End of the Road, with Salgado donating the profits from the book back to the relief organization. Today, photographers such as Sebastião Salgado, Mary Ellen Mark, Susan Meiselas, Eugene Richards, James Nachtwey, Joseph Rodriguez,Ken Light, and Stephen Shames are utilizing photography to bear witness on such global social issues as the environment, famine, AIDS, the effects of war, homelessness, gangs, drug violence, youth culture and poverty with the intention to suggest empathy and/or social change. Contemporary photographers such as Lauren Greenfield, Jim Goldberg, Fazal Sheikh, Simon Norfolk, Luc Delahaye, Paul Graham, Martin Parr and Pedro Meyer are examining the social world with a measured sense of contemplation, challenging the traditional conventions and visual vocabulary of photography that is about the real world. Within the history of photography, which photograph has a dramatic impact on how you see the world? Considering the nature of contemporary visual culture with 24-hour cable news, the Internet, film, magazines, newspapers, books and museums/galleries all functioning as destinations for viewing and engaging photographic imagery of social significance, is it possible for photographs to continue draw upon the traditions of “concerned photography” in not only raising awareness, but also in affecting social change? What does today’s photographer need to take into consideration in order to create work that reflects a sense of clarity between their intentions and the purpose of the images when working within the realm of documentary photography and photographs of the real world?